17 Mar The Kitchen Is Open! 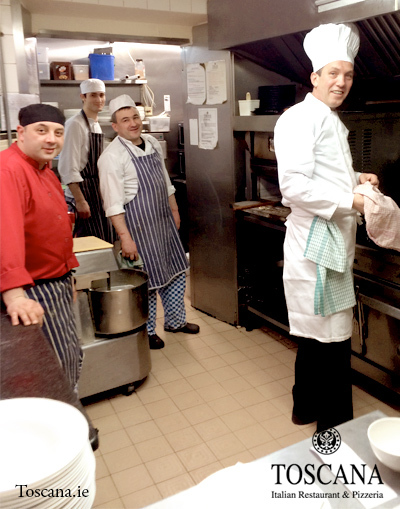 Well hello there, my name is Agie, Chef and owner of the Italian restaurant, Toscana Restaurant, in Dún laoghaire. I decided to start a blog because I love to talk about Italian food all the time and so I thought why not write about it too? The kitchen is now open! So, before you become a devout fan of this blog, a little about myself. After I finished college as a computer programer I decided to travel around Europe. It was in Switzerland where I discovered my passion for cooking, left the keyboard behind and started training as a chef. It was also in Switzerland where I discovered my passion for Irish women and one woman in particular, my wife, Anthea. After I finished my chef training we travelled around Europe, working in some amazing restaurants and hotels and learned all about the hospitality trade and fine cuisine. Eventually, the travels ended and we put down our roots in Ireland and started a family. Me & My Team in the Toscana Kitchen! Like most Chefs, I had a dream to open my own family restaurant and that dream came through. In the summer of 2001 I opened the doors to Toscana Italian Restaurant and pizzeria in the beautiful seaside town of Dún Laoghaire, Co Dublin. Over the years Toscana has gone from strength to strength and has received many awards and accolades for it’s honest authentic Italian Cuisine. I have an amazing creative team working with me some who have been with me since the day I opened. Our menu is inspired by dishes from the Tuscany region of Italy and we are always working to improve it and change it with the seasons. I’m passionate about every plate that I serve to you and the passion starts with our ingredients. One of the things I like most is that we have an organic garden and keep hens so that we can give you the freshest and best ingredients possible, more about that though in the future! The gardens look especially great during the Irish summer so I promise you pictures. And so, my first post is done – thank you for reading it! In future posts I will tell you more about Toscana Restaurant, Italian cuisine in general and I’ll also show you some recipes of our customers favourite dishes! Until next time, buen apetito & ciao!